The 2015 British Touring Car Championship season was the one of the most exciting ever. Gordon Shedden took the title in Honda Yuasa’s Civic Type R, but he did that in the very last race at Brands Hatch Grand Prix Circuit, against Jason Plato in the Team BMR’s Volkswagen CC. Thirty races on ten circuit were held during the season, with ten drivers scoring the victories. Jason Plato, who moved from Triple Eight’s MG to Volkswagen, took the highest step on the podium six times, plus four more podium results. But consistency was the key of the success, so Gordon Shedden took his second BTCC title with four wins and seven other podium places. Other victors were Colin Turkington and Mat Jackson (both four times), Matt Neal and Rob Collard (both three times), Sam Tordoff and Andy Priaulx (both two times), Adam Morgan and Jack Goff who scored once. Andrew Jordan was always around the top, but without wins, so with five podiums and twelve Top 5 results he ended the season on fifth in the championship classification. Between the leading duo and fifth placed Jordan there were Honda’s Matt Neal on third and Volkswagen’s Colin Turkington on fourth. Honda took the title in the manufacturers’ classification, against MG, BMW and Infiniti, but Honda Yuasa Racing lost the title in the Teams’ championship against Team BMR RCIB Insurance. 2014 champion Colin Turkington was the best of the independent drivers and took the Independents’ trophy in front of Jason Plato and Adam Morgan. Jack Sears Trophy, for rookie drivers, has been won by Josh Cook in the Power Maxed Racing’s Chevrolet Cruze. The 2015 championship season was opened at Brands Hatch Indy Circuit with three different winners in three races. Rob Collard was the winner of the Race 1 in the West Surrey Racing’s BMW 125i M Sport, and after that Gordon Shedden and Matt Neal scored two victories for Honda. At Round 2 at Donington Park, we saw two wins of BMR’s Volkswagens, driven by Jason Plato and Colin Turkington. Third race was won by Matt Neal. Truxton Circuit was the venue of Round 3, with Gordon Shedden and Jason Plato as the winners of the first two races. In Race 3 Adam Morgan scored his second ever BTCC victory, driving WIX Racing’s Mercedes A-Class. Jason Plato was dominant at Round 4 at Oulton Park. After he secured pole position he was victorious in two races and he took the lead in the overall championship standings. Sam Tordoff in WSR’s BMW won third race at Oulton Park. It was just the preview of a fantastic weekend for West Surrey Racing at Round 5 at Croft. BMW drivers Andy Priaulx, Sam Tordoff and Rob Collard scored three victories in three races, each of them took one win. First half of the season, after 15 races, was finished with Gordon Shedden in the lead, 10 points ahead of Jason Plato. Round 6 at Snetterton was marked by first ever BTCC victory for Jack Goff, who was driving Triple Eight Racing’s MG. Goff started from pole position in third race of the day and defended his position until the end. First two races were won by Colin Turkington. 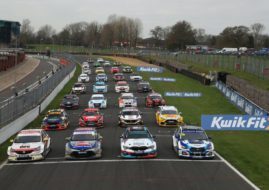 Leading positions in the championship standings were changed again when Jason Plato jumped to the top, Turkington was second and Shedden dropped to third. Honda’s drivers struck back at Knockhill with two wins in the second and third race of Round 7. Rob Collard was the winner of Race 1. Jason Plato remained in the lead after 21 races, with Shedden and Neal moved up to second and third. Round 8 at Rockingham was marked by the first victory for Motorbase Performance squad, which returned to the competition with two Ford Focus cars two rounds earlier. Mat Jackson was the fastest in qualifying session and took the pole position for Race 1, which he won in dominant style ahead of Shedden and Aron Smith. Shedden and Plato won Race 2 and Race 3, so the battle for the championship was much more intense. Shedden came to Rockingham with an 11-point deficit to Jason Plato and left the famous circuit with an advantage of six points. At Round 9 at Silverstone Mat Jackson repeated impressive performance and took the pole and Race 1 victory again. Andy Priaulx and Colin Turkington won Race 2 and Race 3, but all eyes were on two main championship title contenders. Gordon Shedden increased his lead to 23 points ahead of Jason Plato. Turkington jumped to third, ahead of Matt Neal. Fifth placed Andrew Jordan was 64 points behind Shedden, so mathematically he was is still in the game for the title before season’s finale at Brands Hatch. And what a finale it was! Mat Jackson won first two races, while Plato and Shedden were far from podium places. Plato finished fifth and sixth respectively. Shedden was sixth in Race 1, but in the problematic Race 2 he was just 19th and scored no points. With one race to go Shedden’s advantage was 12 points. In the last race, Plato was starting from the front row and immediately took the lead. He remained in front, but Shedden made a heroic progress from 19th place on the grid to 4th on the finish line, so Scotsman took the title with four points advantage. Except the fantastic title fight and stunning victories of Mat Jackson in a second half of the season, one more thing marked the 2015 season. It was the appearance of the first ever disabled driver in BTCC history. Nicolas Hamilton, the younger brother of F1 champion Lewis Hamilton, debuted at Croft with AmD Tuning’s Audi S3. He ran four rounds and twelve races, with best finish on 16th place in Race 2 at Snetterton. All 2015 BTCC results you can find at SnapLap result pages.